In civilization, life is carefully constructed so that meeting our basic needs is generally easy and convenient. When we’re cold, we turn on our heaters and bask in their warmth; air conditioning cools us when we’re hot. We rarely find ourselves rained on, snowed on, or hailed on, and we generally only sunburn out of choice. Our world is made light with the flip of a switch. We browse refrigerators and aisles of neatly-packaged food for our meals, or we order and get them delivered to our door. We find ourselves at the top of a food chain we likely didn’t work directly to climb. In these ways and others, most of us are fortunate enough to have our basic needs met with ease. Meeting one’s basic needs when living outdoors, even by choice, can be much more challenging, as was readily apparent as I walked from Wrightwood to Acton. 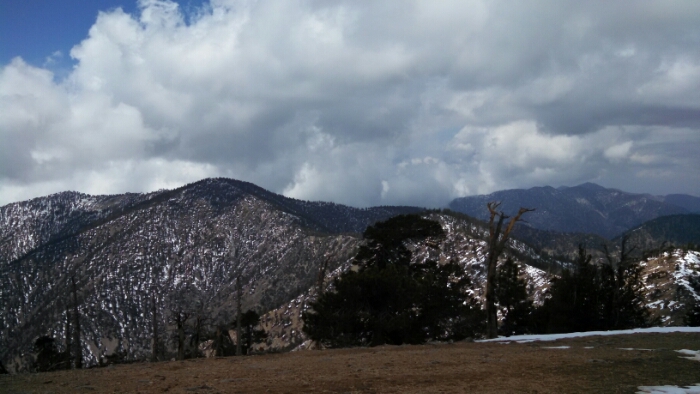 The snowstorm that brought Pine Nut and me running to Wrightwood ushered in a chilly and sometimes even cloudy weather pattern. 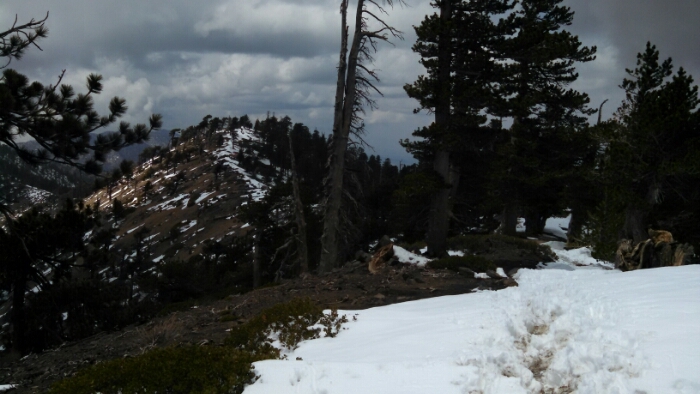 In the low desert, that might have been helpful, but the Pacific Crest Trail goes over the top of Mount Baden-Powell, a 9,406-foot behemoth. The first day I attempted to summit the mountain, the remnants of the storm made the day so wet and bitterly cold that I decided it would be safer to wait for some warmth or sunshine. When I did go up Baden-Powell the following day, I slipped and slid on snow and ice and slush much of the way to the peak. In places, the backside of the mountain was even snowier. I followed the occasionally knee-deep postholes of intrepid hikers as I worked to stay on trail. That night, hoping the thin silnylon of my tent would protect me against the cold wind as I slept atop snow, I thought about human innovation and our fragility. Squirrels and chipmunks scurried among the trees nearby, but hairless me needed to wait out the night wrapped in the feathers of other organisms. The sunshine of the following morning felt miraculous, and relaxing as I descended thousands of feet into the warmth of the desert made me realize how stressed I’d been in the cold. But, soon, the dry heat, too, proved challenging. I drank more water to ensure I stayed hydrated and removed my socks and shoes to cool my feet at breaks. I donned sun protection, both clothing and chemical. At the margins of the trail, lizards and snakes basked in the sun. I sought shade. The path took me along steep, eroded hillsides. The trail, held together with all sorts of metal and wood contraptions, was dangerously deteriorated, and I chose my steps carefully. Unstable footsteps sent pebbles tumbling into the valley below, their clattering resounding in the air as they rolled. The ridiculousness of what I was undertaking struck me as I slowly and methodically moved northward, perched atop a disappearing trail with my trekking poles poking into the rock and providing a fleeting sense of security. How is it that we humans, little desert scavengers that we once were, have become so powerful? How have we wiped out whole species and destroyed entire habitats? 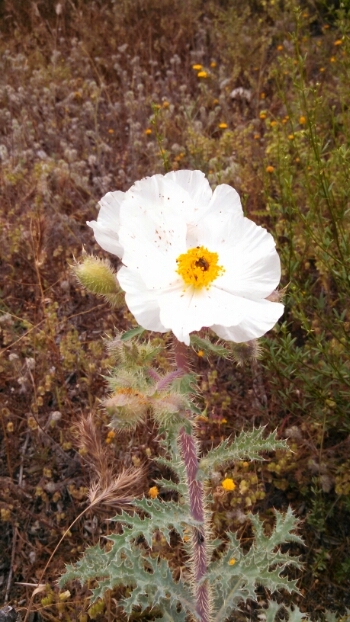 How have we come to occupy every biome on Earth? I thought of the mountain frog whose limited habitat we hikers were avoiding with an extensive detour. I thought of the ancient mountains I treaded on, of how they must have been perceived by the Americans of centuries and millennia ago, who wouldn’t have known what lay beyond them. Why is it that we find the need to leave our mark on the world in such destructive ways? Is our own short existence part of the reason we seek relative permanence? What if we were, instead, to walk gently? What if we left no trace of our time here? What if we just moved through time and space quietly, like leaves in the wind? It’s funny which days are etched forever in our minds. One year ago today, I was enduring my second ambulance ride in as many weeks. 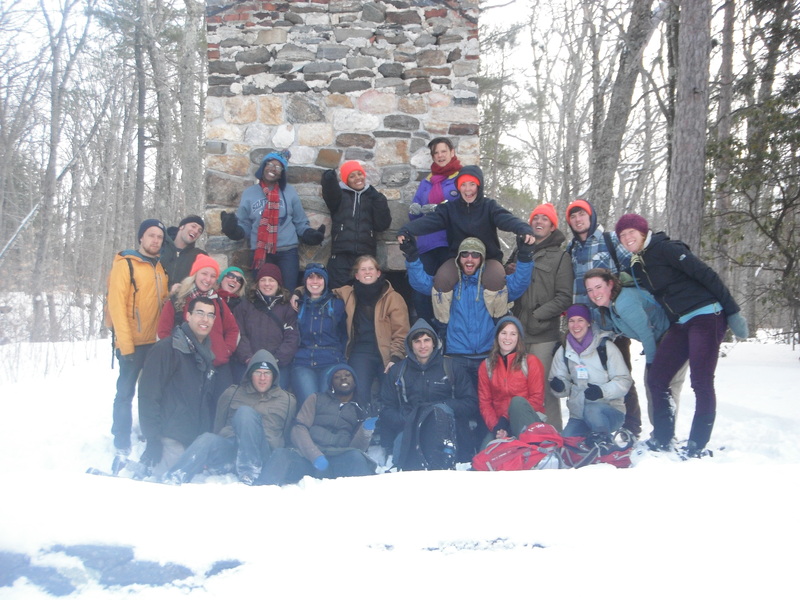 A year before that, after having one of those life-changing, put-in-it-the-memoir family crises, I was living with 26 other people in a bunkroom in a very snow-covered Western Massachusetts as part of the SCA. 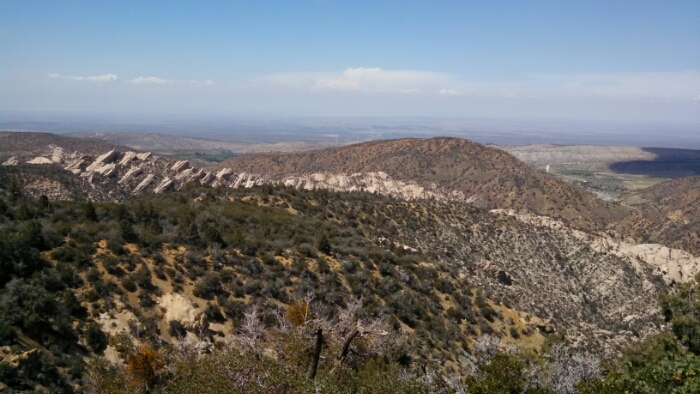 Perhaps it’s the changing weather or perhaps it’s historical precedent, but this time of year sends me into a reverie, and I decided I’d interrupt our regularly-scheduled hiking story to share some of my recollections from my time with the SCA. In this case, the SCA is the Student Conservation Association, not the Society for Creative Anachronism. I stumbled upon the former while searching for the latter. The Student Conservation Association is an organization for which I’ve had tremendous respect for almost a decade now. Most of the members of the SCA are young adults who serve with various organizations and in various capacities across the country as they work to conserve natural areas and promote environmental awareness. Long story short, three weeks after I got my driver’s license (as a 23-year-old), I loaded my tiny little convertible to the gills and drove it 1000 miles to Hawley, Massachusetts. Some SCA positions are “front-country” positions. Like AmeriCorps VISTA positions, these usually see SCA members working individually with organizations, in internship-like settings. Other positions are backcountry positions, where (generally) teams of SCA members serve and camp together. Most backcountry positions focus on trail building, and the position to which I’d been accepted in Hawley was no exception. My interview with SCA Massachusetts was memorable. They asked a question that I’d spent a great deal of time thinking about but still did not have a concise answer to: “How do you feel about cutting down trees?” I suppose my rambling answer — about the way cutting down trees for trails leads to an increased awareness and appreciation of the natural world, which leads to more conservation of trees — must have been acceptable. 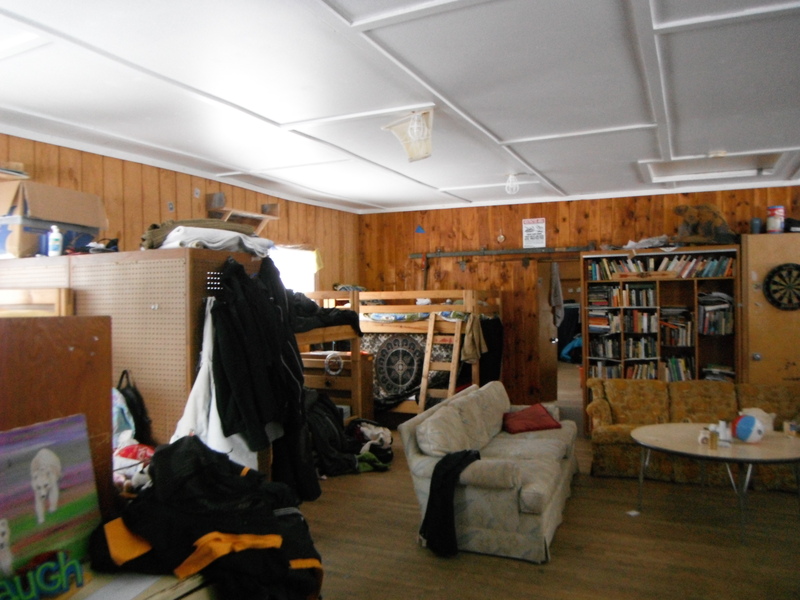 Because of everything that had happened at home, I was a mess when I got to Hawley, but the whole crew of SCA members who were already at the base camp greeted me and helped me bring my belongings into the bunkhouse. Soon, my upper bunk in a corner of the giant room started to feel homey. I don’t think I’ve ever seen as much effort put into group building and communal living as that displayed by the leaders of SCA Massachusetts. They ensured that we had plenty of formal and informal time to get to know one another, led us in many reflections and games (that we could later use when we led classes of children), and set group expectations. They encouraged us to view our base camp as home and took us on outings to familiarize ourselves with the area. Coming from the South, I wasn’t sure whether I could ever feel at home in a place like western Massachusetts in early March. The snow was three feet high, and new snow fell every few days. Winter was my usual running season (and my key stress management strategy), and I couldn’t run at all. 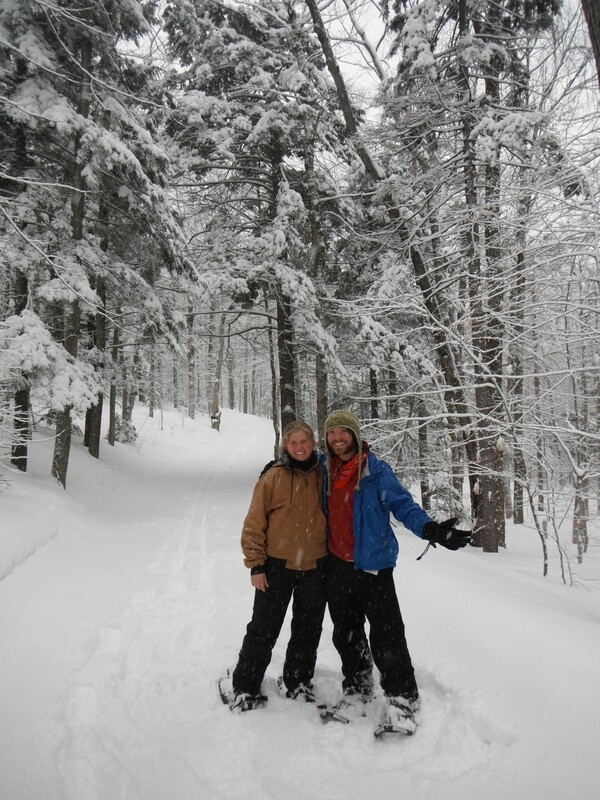 I’d never used snow shoes, and I had no clue how to cross country ski. I didn’t even know how to split wood to heat our bunkhouse. I was eager to learn it all. Serving with the SCA did have its challenges. The 29 (27 SCA members and two leaders) of us who lived at base camp during training had 76 gallons of water to share each day. We rarely flushed the bathroom toilets and signed up for a couple short but precious showers at the start of each week. Our bathroom was up a hill, the path to which I watched go from snow-tunneled to bog-bridged. Sharing one room meant that this SCA member, whose Lyme Disease was slowly rising to the surface, could never get enough sleep. But, it also meant that there were always great people around. It meant that someone could find a book recommendation, a service project buddy, or a head massage whenever the mood struck. Our living situation made for an unforgettable game of Cards Against Humanity by the fire one night, and it gave me a snowy sunrise that brought me to tears a few mornings later. The SCA’s base camp in Hawley earned a special place in my memories. Unfortunately, my time with the SCA was cut short. It turned out that lots of reflection exercises and no space to be alone to process things weren’t very conducive to phase of the healing process that I was in at that time. Our leaders were incredibly understanding when I explained what had been going on and why I needed to leave the program; I was astonished when they invited me to apply another year. Another year, in another mindset, I think a program like SCA Massachusetts would be right up my alley. I love communal living, love the backcountry, and love being around like-minded, passionate people. But, that year, I just needed to be around friends. And so, on a bright sunny day, moments after I’d given my goodbye hugs to SCA Massachusetts, I climbed into my convertible again, turned up the Indigo Girls, and headed to Burlington, Vermont, where, sleeping bag in hand, I knocked on an old friend’s door.